The hiring contract shall be between the hirer and the owners of the Customs House Loft (hereafter called CHL) and shall be deemed to be made subject to these Booking Conditions. The Contract of Hire is not effective until CHL despatches to the Hirer written confirmation of a booking. The hiring contract confers upon the Hirer the right to occupy the property for a holiday only and that no right to remain in the accommodation exists after the date of the holiday, as stated in the Booking Form within the meaning of section 9 of the Rent Act 1997. For all new bookings as of 1st November 2018, a non-refundable deposit of 30% of the total cost of the accommodation is required at the time of booking with the balance due 8 weeks before the date of arrival. Please note that we do not send reminders for the balance. Non-payment of the balance by the balance due date will entitle CHL to treat the booking as a cancellation and they will endeavour to re-let the property. For bookings made within two calendar months of the arrival date, full payment is required at the time of booking. Provisional bookings are held for 48 hours during which time confirmation of the booking is required by payment of either the 30% deposit or full payment. Payments can be made by bank transfer or by credit/debit card, either on our website or over the phone to the gallery. We do not accept American Express. Bookings are not currently subject to a booking fee. Cancellations must be in writing to CHL. In the event of a cancellation every effort will be made to re-let the property in which case 50% of the full payment made will be refunded to you. If however, the property is not re-let, you are liable for the full cost. Changing bookings from one week to another after the booking has been made may incur a £50 fee and changes cannot be made within 8 weeks of the date of arrival. We strongly recommend taking out holiday insurance to cover you if you are unable to take the holiday for any reason. Changeover day is a Friday. Out of season, short breaks may be available, please call to enquire about any late availability. In order that the property can be thoroughly cleaned and prepared for the next arrival, departure time is 10am with arrival being from 4pm. The CHL has a key safe, and you are given the code for the safe to release the door key on receipt of full payment, so you can arrive at any time after 4pm. You must inform us of the number of people staying in the property and at no time must this exceed the number given on the booking form. An over-occupancy fee will be charged if this occurs and CHL reserves the right to refuse admittance if this condition is not observed. Not more than six day visitors to a property are permitted without the prior written consent of the Company which reserves the right to require payment of a refundable breakage’s deposits in such circumstances. Vehicles, baggage and personal belongings are at the Hirers risk at all times. No responsibility will be accepted for loss or damage to any belongings or its contents. Well behaved dogs are welcome in the CHL. An additional charge of £20 per dog is made and we request that they are not allowed in the bedrooms or on the furniture and that all trace of them is removed from the property at the end of the holiday. The property has electric thermostatic wall heaters in all rooms as well as a wood burner in the lounge. A complimentary basket of kindling and logs is provided and further logs can be requested from the gallery below at a charge of £5 per basket. The Customs House Loft has a unique position on the first floor of the historic Customs House, above the Customs House Gallery, with a bird’s eye view of the harbour and out to sea. We try to ensure that the property is heated and aired constantly but retains its inherent character. Any queries regarding the condition of the property, the accommodation afforded or the facilities available must be taken up with CHL within 48 hours of arrival so that any necessary action may be taken. No action in this regard will be entered into after the holiday has finished. The hirer is responsible for looking after the property during the holiday and leaving it in a clean and tidy condition. Any breakages or damage must be reported to CHL at the gallery below and paid for. Where excessive cleaning is required, or damage beyond normal wear and tear has occurred a charge will be made. To facilitate this, we require the credit/debit card details of the person making the booking. These will remain on file until after the letting when they will be removed. CHL reserves the right to refuse any booking and also cancel any booking already made, if in its absolute discretion it considers this to be necessary (e.g. fire, flood). CHL will return to the Hirer the deposit paid and any other sum paid to the Owners by the Hirer. All bed linen and towels are provided but we suggest that you bring your own beach towels. If you have young children in your party, please also bring waterproof mattress protectors. One travel cot, one stairgate and one highchair can be provided, but they must be requested at the time of booking. Linen and bedding for travel cots is not provided. Please make every effort to ensure you remove all your clothing and belongings at the end of your holiday. We will return items to you on receipt of full payment for the postage required. Items not claimed after 28 days will be disposed of. While every effort has been made to ensure that the representations contained on this website and in all advertising are made in good faith, neither they nor any oral representations made by employees or representatives of CHL will create liability on the part of CHL. Please bear in mind that the property is an old, traditional building with narrow stairs and steps between rooms so do take extra care until you have the measure of them. Granite, salt air and paint do not work well together, so despite a constant maintenance programme you may find paint flaking. Likewise, in an older property, damp patches may appear after wet weather due to the construction of the building. Prices as published are held for the current year. Every effort is made to ensure the pricing information on the website is correct but CHL reserve the right to amend prices quoted due to omissions and errors. Prices for subsequent years should be verified with CHL. There shall be no liability for any claim arising from the act, omission or neglect or default of the Owners, its representatives unless proved to be done with intent to cause damage or recklessly and with knowledge that loss or danger would probably result. CHL has no authority to waive or modify these Conditions other than in writing. Any complaint must be made at the time so that it can be investigated and remedied as soon as possible. Complaints will not be accepted or dealt with after the holiday. These include local happenings that may occur at any time, e.g. nearby building work or invasion by pests. CHL does not accept responsibility for any matter beyond their control or for the effects any works may have on your enjoyment of the property. This does not affect your statutory rights. We will always endeavour to ensure that advertised services such as broadband are working but in the unfortunate event of a breakdown no refund will be due. Our website address is: https://www.thecustomshouseloft.co.uk. 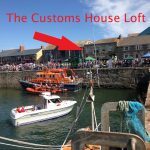 By default WordPress & The Customs Loft House does not share any personal data with anyone.